Cool LED nightlight - Stuart M. Jones Custom Homes, INC. I am starting my blog which should be helpful to our past and future clients. Feel free to share this blog w/ your friends. and our trips in the RV. I went to the National Builder Show in Vegas last week. It is the largest residential building show in the country. It has both seminars, as well as 200,000+sf of exhibits. One cool thing I saw was a new product. 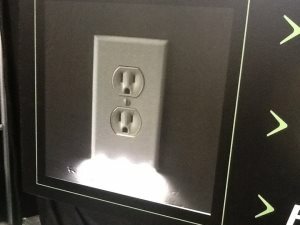 It is a LED nightlight that replaces the standard or Décor style receptacle plate. No wiring involved. Simply turn off the power. Take out one screw. Put on the new plate, that’s it! No wiring involved. 5 cents a year in electric cost. Use it in the hall, bathroom counter, kitchen etc. It is so new, that they are not yet shipping. But, Google Snappower.com. It is called “Snaprays”. They thought the price would be about $20. No, I did not gamble in Vegas. But a vendor gave me $20 in chips. I might be the only one that left Sin City making money!